People in trouble with credit card debt often owe as much as €35,000 on their cards – and have multiple credit cards open at the same time, a debt adviser with Grant Thornton has warned. You’re most likely to own a credit card if you’re in your 30s and 40s, according to research by the consumer watchdog, the Competition and Consumer Protection Commission (CCPC). 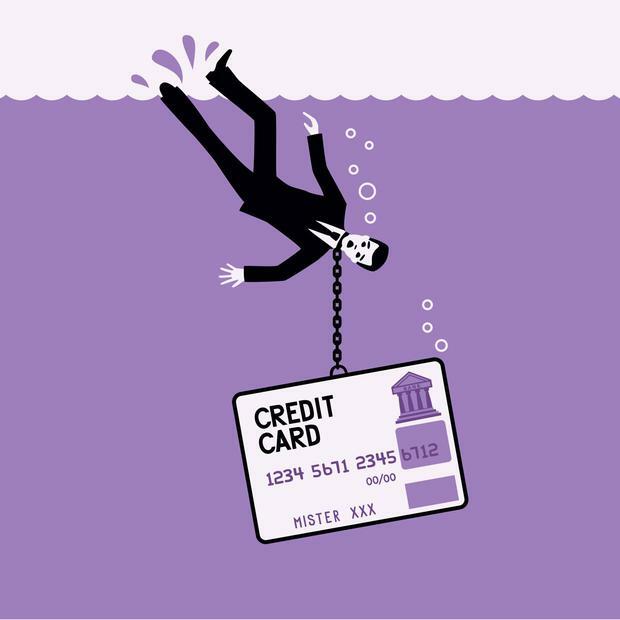 “For many people, their thirties and forties are the most expensive times of their lives – so the credit card can become the go-to financial product in emergencies – or if you must pay for something unexpected,” said Aine Carroll, director of communications and policy with the CCPC. Worryingly, six out of 10 credit card users don’t know the interest they pay on their credit card bills, according to recent research from the Irish League of Credit Unions. Credit cards are one of the most expensive ways to borrow money – the interest charged on credit cards could be eight times the interest you pay on your mortgage. The interest on a credit card bill of €1,000 could add up to as much as €2,061 after five years – more than twice the amount initially borrowed, according to Ronan Coburn, forensic accountant with the Dublin banking consultancy, The Bottom Line. This is based on a borrower who fails to pay off any of a €1,000 credit card bill over the course of five years, where the credit card interest rate is 22.9pc, and where the card was used to buy things (rather than withdraw cash). There are a number of credit cards – including AIB’s ‘be’ cards and Avantcard’s ‘One’ card – which charge 22.9pc interest on credit card purchases (the interest which kicks in if you use your card to buy goods and services, such as clothes in a shop or a meal in a restaurant). At that rate, after only a year, the interest on a credit card bill of €1,000 could add up to as much as €251 – quarter the amount initially borrowed, according to Coburn. This assumes that none of the €1,000 bill was paid off over the course of a year. The more you borrow on your credit card, the more interest you face. If you ran up a €5,000 bill, the interest alone could add up to €1,254 after a year – if the interest rate on your card is 22.9pc, according to Coburn. Fail to repay any of that €5,000 over the course of five years and the interest could be as much as €10,306. Even a small credit card bill could see you pay over the odds in interest. Spend €500 on your credit card and fail to repay any of that bill over the course of a year and the interest will add up to €125 (under an interest rate of 22.9pc), according to Coburn. Fail to repay any of that €500 bill over the course of five years and the interest will clock up to €1,031. When you sign up for a credit card, you are usually offered the option to pay a minimum amount off your credit card every time your bill is due to be paid. This is usually around 2pc to 5pc of the total amount you owe. It will take years to clear a credit card bill and cost you a lot of interest if you opt for the minimum payment (which is why it is known as the minimum payment trap). For example, it would take four-and-a-half years to clear a €1,000 credit card bill if you only repaid 3pc of your bill each time your bill was due to be repaid – and if the interest rate on your card is 22.9pc, according to the CCPC. For this reason, avoid paying only the minimum off your credit card bill. Instead, always clear your bill in full and on time. When it comes to interest, the most expensive is Bank of Ireland’s Aer credit card – as it charges 26.6pc interest on purchases. The second-highest interest rate on credit card purchases is 22.9pc and this is charged on a number of cards, including AIB’s ‘be’ cards, An Post’s ‘Money’ card, and Avantcard’s ‘One’ and ‘Reward plus’ cards. Ulster Bank and Permanent TSB aren’t too far behind. Ulster Bank’s Classic card charges 22.7pc interest on credit card purchases while Permanent TSB’s Ice card charges 22.53pc. Credit card charges should also be watched as these are high and are added to your credit card balance. Avantcard and An Post are the most expensive for credit card charges – with a late fee of €15.24 (if you’re late paying the minimum payment off your bill), an overlimit fee of €12.70 (when you go over your credit card limit) and a returned item fee of €19.05 (charged when you don’t have enough money in your account to clear a credit card transaction or direct debit). An Post’s Money card is issued by Avantcard. You can avoid paying interest on credit cards if you only use the card when buying goods and services (as opposed to using it to withdraw cash) and you pay off your bill in full by the date it is due to be repaid. Most credit card providers have an interest-free period of 56 days for credit card purchases – so, as long as you repay your bill within that time, you’ll avoid interest on credit card purchases. If however you don’t repay your bill on time, you’ll be hit with credit card interest from the date you bought the items. Don’t use your credit card to withdraw cash. Most credit card providers don’t offer an interest-free period for cash withdrawals – so you are usually charged interest from the date you withdraw the cash. AIB is the only credit card provider which has an interest-free period on cash withdrawals . Avantcard, An Post, Bank of Ireland, KBC, Permanent TSB and Ulster Bank all charge interest on credit card cash withdrawals from the date of the withdrawal until the date the debt is repaid. The interest charged on cash withdrawals is often at least 19pc. There is usually a cash advance fee on cash withdrawals too – and this is typically around 1.5pc of the amount withdrawn. You may be able to avoid interest on cash withdrawals if you have enough money in your credit card account to cover the amount withdrawn. Always check the terms and conditions of your card so you know how interest is charged – as it may work differently to others. For example, there is no interest-free credit period on credit card purchases with AIB’s Low Interest MasterCard or AIB’s Budget MasterCard, though these cards are not currently on offer to new customers. Be wary of quick fixes to credit card debt. Gambling is not a solution. Transferring a credit card debt from a high-interest card to a new card which charges no interest for a certain amount of time can be a step in the right direction – but only if you have a plan in place to clear the debt by the time the interest-free period is up. “People who accrue large amounts of debt on their credit cards are often lured in by the interest-free periods on new cards,” said Garland. “However, they often don’t clear the debt within the interest-free period and are unaware too of the interest rate they’ll get hit with once the interest-free period is up. They often don’t cancel the card that had the higher interest rate either – so they end up in more debt,” she added. What should I do if I’m in serious credit card debt? Get advice from the Money Advice and Budgeting Service (MABS) or a personal insolvency practitioner (a type of debt adviser) if you’re in serious credit card debt. There may be solutions open to you which you didn’t expect to be. How do I know I’m in trouble with my credit card? Signs that you are about to — or have already — run into problems with your credit card include weekly usage of your card for household and other expenses, or a reliance on your credit card as a form of borrowing. “If you need to borrow money over six to 12 months, a credit card is not the way to do so,” said Aine Carroll of the Competition and Consumer Protection Commission. How can I avoid building up a large credit card debt? Don’t use your credit card to withdraw cash as it is difficult to avoid interest if you do so. When using your credit card to buy things, pay off your bill in full by its due date. Note how long you have to pay your bill after it is issued — and be sure to clear your bill within that time. With Ulster Bank for example, you must pay off your bill within 25 days of your statement being issued. What if I can’t pay off my bill in full? Should you have built up a large debt on your credit card which you can’t afford to repay in full, pay off as much of it as you can — and clear it in full at the earliest possible opportunity. Consider switching your credit card debt to a credit card which charges no interest for a number of months — and make it your priority to clear your debt within that interest-free window. A number of cards have longer interest-free windows than others. An Post’s Money credit card for example charges no interest on balance transfers for the first year. Understand what interest rate will kick in once the interest-free window ends though. Be sure too to close your old credit card when transferring a credit card debt to another card. Otherwise, you’ll end up with multiple credit cards — and risk having multiple credit card debts. The interest charged on some personal loans is a third of that charged on some credit cards. For example, the interest rate on Avantcard’s personal loans starts from 6.1pc (depending on credit history and the loan size).